Fire crews camped out in the Oakland Hills overnight to keep an eye on any potential hot spots after a threatening brush blaze broke out Tuesday afternoon. Bob Redell reports. Crews camped out in the Oakland Hills overnight to keep an eye on any potential hot spots after a grass fire broke out Tuesday afternoon, posing a threat to dozens of homes. 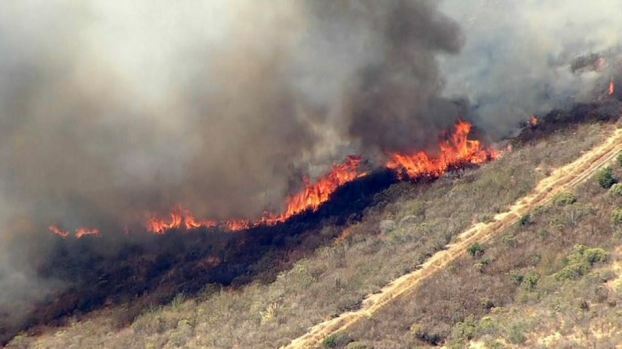 The so-called Edwards Fire torched 22 acres of hillside near Edwards Avenue and Mountain Boulevard, but its forward progress has been halted, according to fire officials. The fire triggered a four-alarm response and prompted the evacuation of more than 100 homes, fire officials said. All evacuations were lifted late Tuesday. Oakland Fire Battalion Chief Melinda Drayton said Wednesday morning that the fire is 80 percent contained. She hopes it will be fully contained by 8 p.m. There are no active flames on the hillside but crews will be keeping watch all day and are also using a drone from the Alameda County Sheriff's Office to look for hot spots, Drayton said. One firefighter from a supporting agency was treated for dehydration and was then released Tuesday. No other injuries were reported. Investigators have determined an area of origin for the fire, a site on Skyview Drive where construction was taking place Tuesday on a large home, according to Drayton. She said potential witnesses are still being interviewed to determine the exact cause of the blaze. A red flag warning issued by the National Weather Service for the East Bay hills remains in effect through this afternoon because of dry weather that poses a high risk of wildfires. "We're just making sure we are putting the message out for everyone in the hills to be hyper vigilant today," Drayton said. While the fire was at its peak, police did not allow residents to enter the upscale neighborhood to make sure their homes and pets were alright. Fire crews parked in driveways to protect the multi-million dollar homes. People who live on Bohansen Road and Ridgemont, Viewcrest, Bayview and Skyview drives were among those evacuated. Golden State Warriors star Klay Thompson is believed to be among those who were removed from their homes. Merritt College was evacuated, while Community Day School was not. The Oakland Zoo was not among the structures that were evacuated, but officials, out of an abundance of caution, stopped admitting new guests on Tuesday afternoon. People inside the park were told that they could stay or leave at any time. Edwards and Keller avenue offramps on I-580 were closed — creating a backup on the freeway — and people were asked to avoid the area. 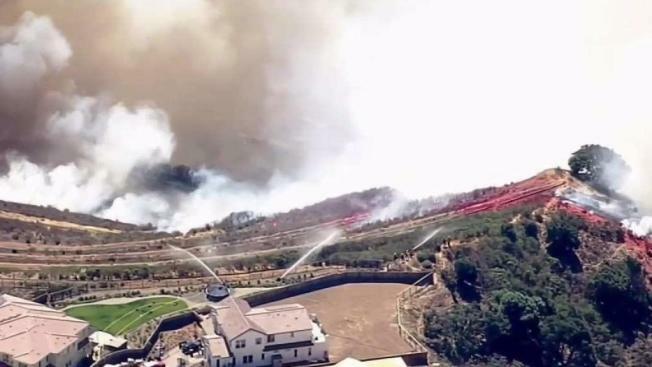 A four-alarm fire on Tuesday threatened dozens of homes in the Oakland Hills and prompted evacuations, Cal Fire officials said. The blaze quickly jumped from one to five to 10 and then 20 acres in under an hour and was upgraded from two to four alarms in the same time frame. NBC Bay Area's SkyRanger captured footage of a thick plume of smoke above the burn scar — visible from nearby I-580 — as well as planes dumping water and fire retardant to suffocate the flames. Officials said that the steep terrain, rate of spread, flame length and wind conditions were among the challenges firefighters faced. 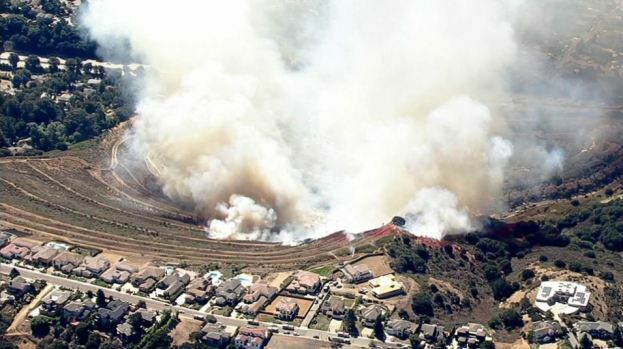 More than 300 firefighters rushed in from the air and the ground as wind-driven flames moved toward townhomes in the Monte Vista Villas complex, White said. Oakland firefighters were joined by Cal Fire and Berkeley crews. The East Bay Regional Parks said it contributed a helicopter to help fight the flames. Tuesday's fire rattled people in the neighborhood. Roughly 26 years ago, a devastating fire in the same part of Oakland Hills killed 25 people and destroyed 3,500 homes.